I donít know what makes a great love story. Is it that instant attraction when boy meets girl? The passionate kisses and the fairy-tale ending? Or is it a lifetime of tragedy, paid in advance, for a few stolen moments of pure bliss? The pain and the suffering that, in the end, you can say are worth it for having found the missing piece of your soul? The answer is: I donít know. I donít know what makes a great love story. I only know what makes my love story. I only know that finding Cole when I did, when Emmy and I were running from a nightmare, was the only thing that saved me. That saved us. He was more broken than I was, but somehow we took each otherís shattered pieces and made a whole. If that is what makes a great love story, if that is what makes an epic romance, then mineÖours is the greatest of them all. When you have two broken…no three broken people, can they combine their broken pieces to make one family? Only if they let each other in and trust. That’s a problem for Eden, she doesn’t trust anyone. She has great reasons for it. And no, we don’t get to know what they are right away. Cole feels guilt. So much guilt that he pushes everyone away to live in his grief. He has great reasons too. We know parts of his guilt but not all right away. This story is a masterful puzzle that displays the beautiful story one piece at a time. The author tells us enough to understand the characters but not all the details. The combination held my interest so well that I read it pretty much straight through. I love this author’s style of mixing just enough summary to move the live story along at a great pace. I never felt like I missed a moment. I was anxious to get to the next meeting with Cole and Eden. And this was a perfect style to make that happen. I adored Emmy. My heart broke for her stress and anxiety. When I discovered the cause, my mama bear claws were out in full force. This character…all of these characters invoked strong emotions in me. An interesting twist turns up near the end. I’m not sure I want to even explain but it had me both satisfied and interested in what else may come. That’s something that just doesn’t happen for me. Only a brilliant story teller can pull that off. Some books that bring the broken characters are emotional and hard to read. This one was emotional but not hard to read. I raced through it and loved every minute. 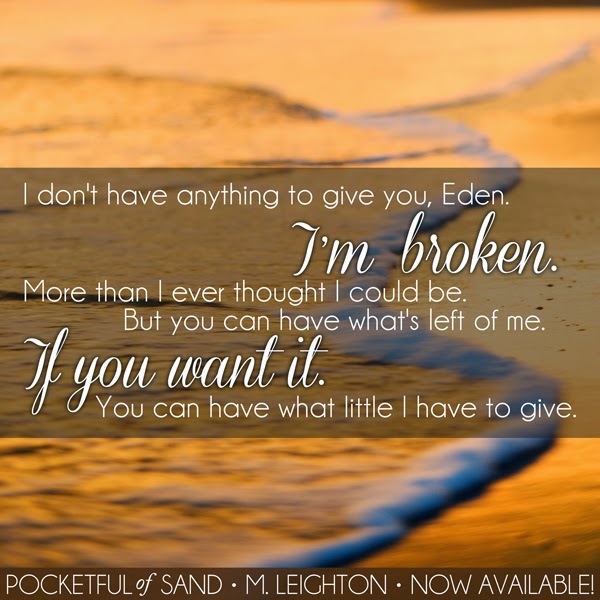 If you’ve ever read M. Leighton before, you will definitely want to get this one soon. If you’ve never experienced this awesome author’s stories, then you want this one next. It’s romance at it’s best. Her books have it all. Don’t miss it. I loved this book so much. Michelle doesn't disappoint ever. Great review!